Established as a provincial park in 1993, this park is centered around the picturesque Duffey Lake and overshadowed by the Mt. Rohr. It is a popular spot for canoeing, kayaking and wildlife viewing. Use caution, as the wind can be strong at times while on the lake. The park offers a rough gravel boat launch. Located along Duffey Lake Road (Highway 99) about 35 km east of Pemberton, nearly midway to Lillooet. It is about a three hour drive from Vancouver. The Duffey Lake Road is a scenic highway that forms part of an automobile tour route called the Coast Mountain Circle Tour. This route forms a 700 km circle from Vancouver and takes from two to four days to enjoy all the sites. 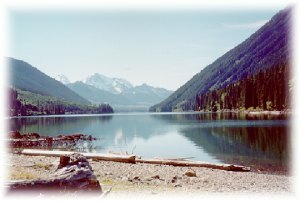 Heritage Culture - The Duffey Lake/Cayoosh Creek Valley was historically used as a travel route between the Lillooet First Nations on Lillooet Lake and the Stl’alt’imx First Nation on the Fraser River. The area was important for hunting, trapping and gathering. Conservation - The main conservation role of Duffey Lake Provincial Park is to protect a representative portion of the Leeward Pacific Ranges ecosection and to protect important wildlife habitats, particularly for goats and bears. The Duffey Lake area contains some of the flora, fauna, landforms and waters which are characteristic of the region, and illustrates transitional vegetation between coastal and interior climates. Wildlife - Mountain goat, grizzly bear, deer, black bear, osprey and great blue heron can all be found in the park. There are opportunities for canoeing or kayaking in this park. Use caution, as the wind can be strong at times while on the lake. Limited fish available at this lake. Anyone fishing or angling in British Columbia must have an appropriate licence. There are no formal trails in Duffey Lake Park. Backcountry hiking is permitted. Please follow "leave no trace" ethics. Parking for vehicles and boat trailers is limited. Please do not block the launch ramp area. Overnight mooring is not permitted.